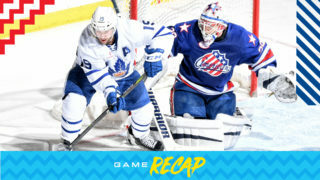 The Toronto Marlies dropped a tough one in the final seconds Saturday night to the Lehigh Valley Phantoms. Chris Mueller scored the equalizer at 18:03 of the third period and it looked like things were headed for overtime until the Phantoms scored right as the buzzer sounded to end regulation. After a brief review, it was deemed a good goal, giving the Phantoms a 4-3 win. Tanner MacMaster opened the scoring at 8:51 of the first period, firing home a one-timer from the slot. Michael Carcone and Jordan Subban assisted on the goal. At 15:47 the Phantoms found the back of the net to even the score 1-1, that goal coming from Tyrell Goulbourne. The score remained locked at 1-1 heading into the second period. It was a quiet middle frame with no goals scored. Lehigh had two opportunities on the man-advantage but the Marlies’ special teams killed off those penalties to keep things even at 1-1. The third period was the busiest as the two teams combined for five goals. Chris Mueller got things going at 9:51 as the Marlies converted on a power play opportunity to break the deadlock. Jeremy Bracco and Rasmus Sandin assisted on Mueller’s 26th of the season. Goulbourne responded with his second of the night at 11:34 to even things back up 2-2. Minutes later, the home team took their first lead of the night as Reece Willcox scored to make it 3-2 for the Phantoms. 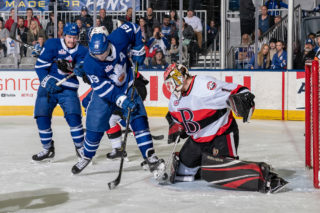 The Marlies continued to press with time winding down and at 18:03, Bracco and Mueller connected again to even the score 3-3. 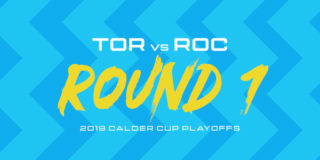 A late penalty to the Marlies gave the Phantoms one final chance one the man-advantage, and they capitalized at 19:59 as Chris Conner potted the game winning goal as the final buzzer sounded. The Marlies will close out their three in three tomorrow as they take on the Wilkes-Barre Scranton Penguins. Tanner MacMaster opened the scoring at 8:51 of the first period. MacMaster has 16 points (4 goals, 12 assists) through 46 games this season. Chris Mueller scored on the power play at 9:51 and at 18:03 of the third period in his 700th AHL game. Mueller has recorded a goal in his last seven games. Mueller has 55 points (27 goals, 28 assists) in 49 games this season. Michael Carcone recorded the primary assist on MacMaster’s first period goal. Carcone has 39 points (17 goals, 22 assists) through 52 games this season. Jordan Subban registered the secondary assist on MacMaster’s first period goal. Subban has 13 points (3 goals, 10 assists) in 39 games this season. 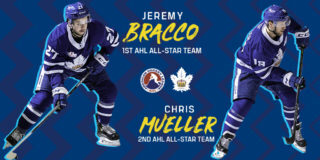 Jeremy Bracco had the primary assists on both of Mueller’s third period goals. Bracco has 19 points (4 goals, 15 assists) in his last 13 games. He leads the AHL in assists (49). Rasmus Sandin picked up the secondary assist on Mueller’s third period power play goal. This is Sandin’s sixth consecutive game recording a point (1-7-8). Timothy Liljegren recorded the secondary assist on Mueller’s second goal of the third period. Liljegren has 12 points (3 goals, 9 assists) through 33 games this season. Kasimir Kaskisuo stopped 32 of 36 shots he faced. Kaskisuo is now 9-9-2-1 on the season with a .886 Save Percentage and a 3.38 Goals Against Average. Toronto is 18-8-3-2 since January 4 and have outscored their opponents 101-88, facing 16 different teams. In 23 of 31 games, Toronto has earned a point (41). Toronto went 1-for-2 on the penalty kill and 1-for-5 on the power play. Toronto’s power play on the road is first overall (25.8%) in the AHL with the most power play goals-for (39). Toronto had a 40-36 edge in shots in all situations. Nick Baptiste led the Marlies with five shots on goal. The Marlies are 8-6-0-1 against Atlantic Division opponents and are 0-2-0-0 against the Phantoms. 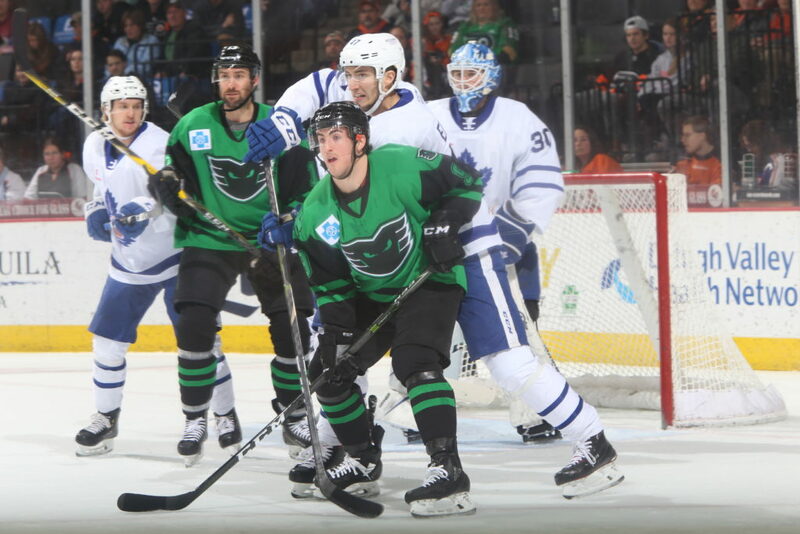 The Marlies hosted the Phantoms on December 2, losing 5-2. Toronto is 27-8-1-2 when recording the first goal of the game. The Marlies are 9-6-3-1 when tied after the first period and 7-4-3-2 when tied after the second period. Toronto is 16-11-4-2 when outshooting their opponent. The Marlies are 12-6-0-0 in Saturday games and are 4-2-0-1 in March. Tanner MacMaster has points (1-1-2) in consecutive games. Chris Mueller has points (3-1-4) in consecutive games. Rasmus Sandin has points (1-7-8) in six consecutive games. Jordan Subban has points (1-1-2) in consecutive games. There are for sure (good stretches). Our team’s grinding here, trying to find its way. Obviously, very disappointing the way that the game ended but I like the fight in our team to get us back into the game and give us a chance to get the point. I hate the call that’s made at the end of the game. It’s, to me, unacceptable but we’ve got to kill it, the penalty kill’s been very strong for us so we had to find our way through that. I thought we lost our composure there, right in the dying moments of the game (and) opened the door for them. There’s some strong points throughout the game for sure. Not enough, not enough consistency with it. All the way through, I thought we had waves of really good play and then we’d get it back and give up some good chances. Kas was very strong for us today, stopped a number of big chances. It’s very disappointing with the effort that he gave today that for one of the soft ones to go in like that is tough because he made so many great saves and kept us in the game but we’re just going to have to turn the page here and get ready for tomorrow. The Toronto Marlies continue their three-game road swing with a stop in Lehigh tonight to take on the Phantoms. This marks the second and final regular season meeting between these two teams, with Lehigh holding a 1-0 lead in the season series. 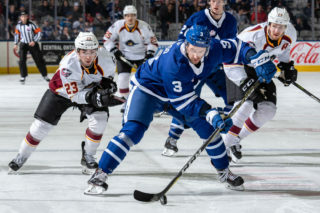 The Marlies are fresh off an overtime win over the Hershey Bears last night and will be looking to even up their season series against the Phantoms and extend their win streak to two. 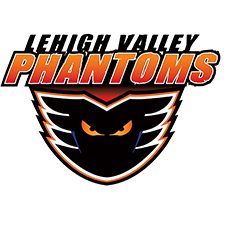 The Phantoms have been on a bit of a slide and have dropped their past three and seven of their last 10. They’ll be looking to snap their losing streak and get back in the win column on home ice tonight. 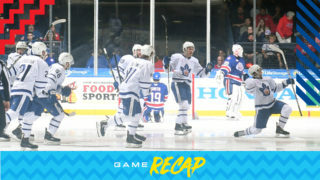 Players to watch: Chris Mueller returned to the Marlies lineup last night and registered the game winning goal in overtime. He has points (six goals, five assists) in seven consecutive games and leads the Marlies with 25 goals. Jeremy Bracco recorded three points in last night’s contest, extending his point-streak to three consecutive games. He continues to lead the Marlies with 65 points in 62 games, and leads the AHL with 47 assists. Rasmus Sandin recorded two assists last night in Hershey, bringing his point-streak (one goal, six assists) to seven consecutive games. Phantoms’ forward Greg Carey scored a goal and an assist in last night’s game against Laval. He leads Lehigh with 56 points (26 goals, 30 assists).